Discussion in 'Showroom' started by redhotsonic, Jul 2, 2015. @MarkeyJester it seems to me that that's an image being displayed through the Mega Drive (possibly the 32X) But the conversion seems far more clean than say that of Retro Graphics Toolkit. I've also theorized that you broke parts and had them use different palette lines. The art does use a small amount of color variation after all (Pink, beige, white, red, gold) But I'm probably wrong, so, tell me your secrets. Considering it looks like he took a photo of a TV, I'm guessing it's a direct-colour DMA. Not the kind of thing you'd get running in most emulators. No, the reason I took a photo from hardware was because the colour on emulators is really poor, and the ones that are good at it, have bloody interpolation filters. This is nothing to do with that above, in fact, using that method would remove quite a bit of the details in the image. Furthermore, I wouldn't show off something that's already well established, there would be no point other than to brag. AkumaYin and Mr. Cat like this. Art is still in development. This is why the blocks are so repetitive overall in the foreground. B. Comet, NeoFusionBox, Calvin and 9 others like this. @EMK-20218 That looks pretty good, I like the background in particular. @Novedicus What is Sonic & Friends anyway? I can't find anything about it, let alone the download link. @EMK-20218 This is some beatiful art, but heck, those BG buildings look so JPEG-ish, I can't even say why, but maybe it's because of your color choices. 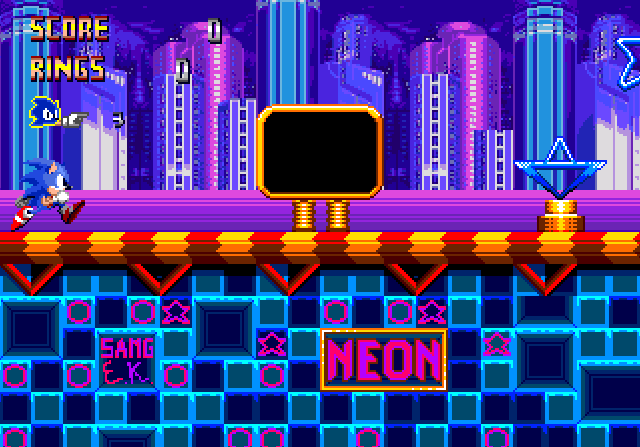 Overall, I love when people do custom tilesets, and this one looks really awesome for an unfinished one! P.S. Just take a look at this building. I prefer the low quality buildings actually; they're supposed to be far off in the distance, and the blurriness gives the illusion of unseen details. NeoFusionBox, Calvin, EMK-20218 and 1 other person like this. Updated. Foreground is made a bit less repetitive and foreground details were added. A-S-H, BurningFlame, NeoFusionBox and 4 others like this. Jdpense, TheInvisibleSun, TheBlad768 and 11 others like this. I made a new title screen for my project. Any suggestions/criticism? The PE looks a little stretched, also the title in general is just not centered. In addition to Iso Kilo's words, I can suggest you reshading your upper part, it doesn't match your shading in lower part, here's an example (btw I tried to fix the C letter but I was too lazy to finish it). 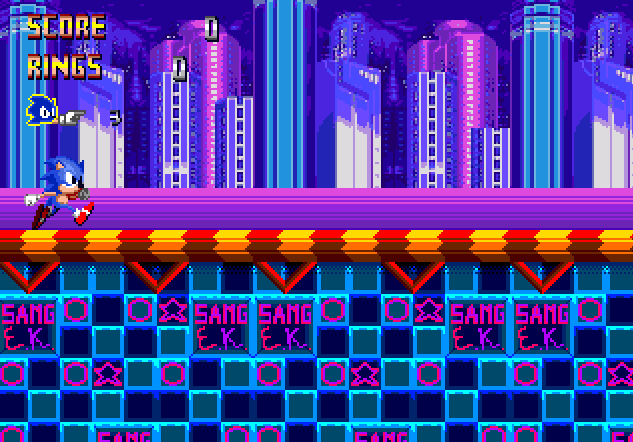 Also, I don't think that these dithered tiles at botton of each dark tile are necessary. Btw, you should really recenter your logo. 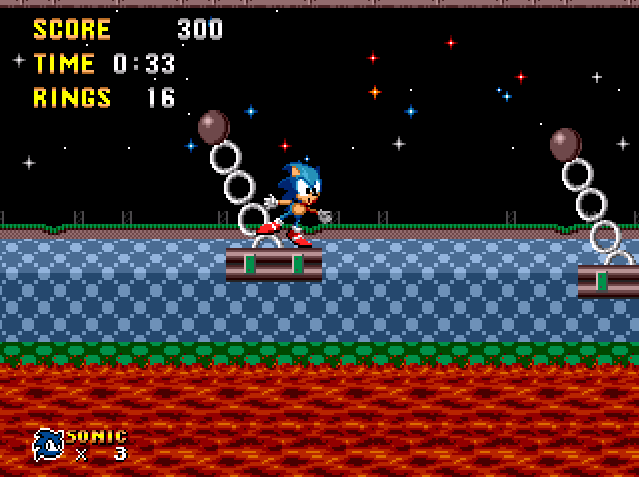 Sonic gets a somewhat new move! ...I guess. TruffledToad, Calvin, A-S-H and 1 other person like this. It's pretty nice work, I like how it uses PCM music for the soundtrack, not many people use that. mainly because they don't want to use up ROM space. Although I don't like how it's just a palette edited and layout edited GHZ, maybe you can change up a few tiles and add some new chunks. Anyway, this is a good start, if it would be a project or just a test, I still like what you are doing, and if you keep up, you might make a decent ROM hack. I see an issue with the quality of the video, if you using Kega Fusion, install the .ini file inside the folder and you must convert the video with some video converter, I recommend export wmw or mp4 for YouTube. And I like the PCM music, the palette is good but, you must reduce a bit the clarity. A little suggestion: Double spikes seem to be not good in this case, I know you're learning level design and more, but excuse me, I recommend follow the original level if you want better results. I can help with that if you want but is a nice start, keep it up. Calvin and SMS Alfredo like this. Just Molten Metro with better stars I guess. Dj. Joker 27, A-S-H, B. Comet and 1 other person like this. @SMS Alfredo, I see an issue with your palette, pink grass is ok, but the ground is a little bit too light and it blends with grass, try making grass or ground darker, because your level needs contrast to look nice. SMS Alfredo and Renegade like this. I see an issue with the quality of the video, if you using Kega Fusion, install the .ini file inside the folder and you must convert the video with some video converter, I recommend export wmw or mp4 for YouTube. So I looked through all of Kega Fusion's folders, including the video codec one, and the only .ini I see is the one used by the application itself for the settings. Am I doing something wrong? Is my version outdated, or do I just have no idea what I'm doing? The .avi format from Kega Fusion has got a glitch generally, like the Gens movie emulator the video compression must be in %75 with Microsoft video codec. The .ini file contains the configuration from the recording process for that working correctly, right-click in the .ini file, select install and record again the video. But once finished, you'd have to convert the video with Windows Movie Maker or another program video converter "in case you haven't by default a video converter". EMK-20218 and MarkeyJester like this.